Click the small page images to download technique sheet pages. Why buy Christmas decorations when it's more fun to make your own? 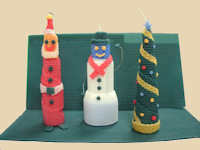 These three holiday candles are inexpensive holiday craft projects for family get-togethers. Use them as part of your home decorations, or give them as gifts. This handy 3-page technique sheet shows how we made them, but make them uniquely yours with your decorations, colors, and personal style! Keep them out of drafts and away from fans while burning, as you would any other candles or open flames. Candles made from honeycomb sheets burn faster than solid candles. 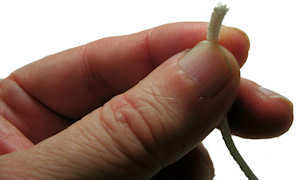 Trim the wick to 1/4" to 1/2" long before lighting. You can start with a longer wick when making the candle, but trim it before use. Place candles on or in suitable candle holders. Spray candle holders lightly with any non-stick cooking spray for easier cleanup: the spray will keep any drips from bonding as tightly to the candle holder. We recommend this wick for beeswax candles 1" to 1-1/2" wide. Wicks for beeswax candles generally have to be about double the width of wicks for paraffin candles of the same size. The wider wick produces the best flame-to-burn ratio, allows the candle to burn almost entirely and without tunneling. Monitor the length of the wick as it burns; it may require trimming to prevent burnout to the edge of your candle. Always use a catchplate or candle holder with catch space in case of hot wax run-off. 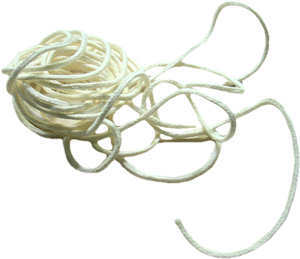 Square braid cotton wick generally works best for beeswax candles. This wick does not have a wire or metal core. You can mix colors to reach quantity discounts on beeswax sheets. We apply quantity discounts in store before shipping your order. 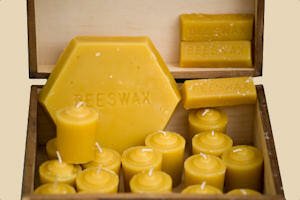 Beeswax is one of nature's most beautiful products. It's derived from the nectar of flowers, the same source as honey. Natural beeswax has several desirable properties, including its natural, sweet smell and its smokeless and dripless characteristics. Beeswax also has a relatively high melting point, approximately 145°F. This means, with attention to keeping the wick properly trimmed, a beeswax candle can burn more slowly than a comparable candle made of paraffin. Melted beeswax shrinks very little upon cooling, which means that the liquid volume is close to or equal to its dry weight. Because it doesn't shrink much, extra care must be used to prevent its sticking in molds. Our beeswax is 100% pure and natural. The color of the wax may vary by season.